Garage: "Uncovered, Total Parking Spaces: 2.00"
Lot Size: 600sq. 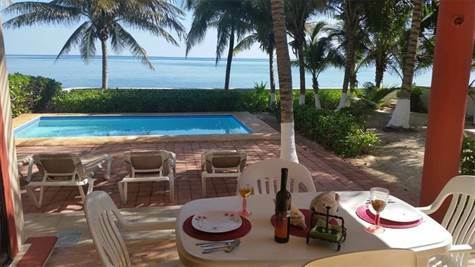 m. n/a "Rectangular"
Fully furnished private beachfront villa in a gated community. Oceanfront, porch, patio, and a private rooftop sundeck. There is also a separate efficiency apartment on the premises away from the house, that you can use as a guest apartment. All on a 600 meter beachfront lot. Also has a storage shed.This property is a solid investment. \r\nThe ocean in front of the house is an aquatic national park -no jet skis, no parachute boats- and the land behind the property is also a protected ecological area; an amazing place to enjoy the Caribbean. Take a look with this property... the paradise lifestyle awaits you.